Happy Monday! I hope you all had a wonderful Easter 🙂 Personally, I still feel like I’m in a ham-and-potato-salad coma…after all the church, cooking, Easter-egg hunting, and eating I did yesterday, I need a nap already. So, I’m sad to report that the Crock Pot Ranch Chicken Tacos that I tried out for last week’s menu weren’t all that great. They were fine, just no big “wow” that I was expecting, based on the comments I saw from Pinterest. 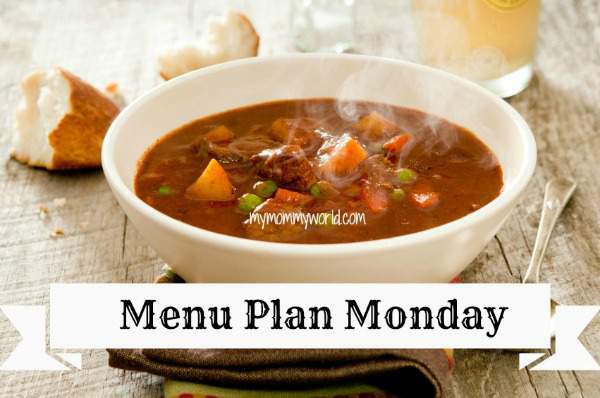 For more ideas for your own menu, check out my menu planning tips for busy moms, or the Menu Plan Monday link-up over at Org Junkie! Sounds like you had a nice Easter. This year I didn’t go overboard in preparing our Easter dinner. So we aren’t swimming in leftovers like usual. I also put the leftover ham into the freezer for later, so we wouldn’t grow tired of it and then have it go bad. We only have a little fruit salad leftover and a few deviled eggs. Which we should be able to eat up right away. Most of our meals will be from the freezer this week. Which will make for easy meal prep for me. What is in the breakfast pizza you mentioned? Putting the ham in the freezer sounds like a smart idea…I will have to put my ham bone in the freezer to make soup with in a few weeks. I was hoping to use the colored eggs to make egg salad or deviled eggs, but they were all so cracked that I didn’t feel it was safe to eat them. I hate throwing out a dozen eggs, but at least the kids had fun coloring them. I make something very similar to your Football Sandwiches, but it doesn’t include the mustard. I’ll have to give that a try. I’m working on whittling down the leftovers here, too. I hopped over from Organizing Junkie. Have a great day! Thanks so much for stopping by Lori! My husband asked me to make the football sandwiches this week, since he loves them so much 🙂 I think the sauce on the top is what makes them taste so great. I’m so glad that you and your family had a fun, full Easter weekend. 🙂 Your menu for the week sounds delicious! Thanks Sandra! I hope you had a wonderful Easter too! 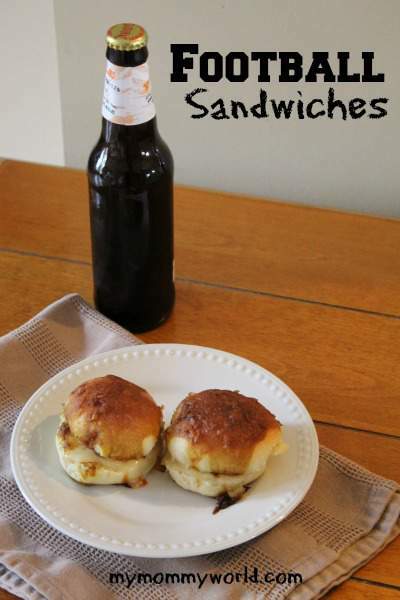 The football sandwiches look delicious! We made ham and bean soup, along with ham and egg sandwiches to use up our leftover ham.